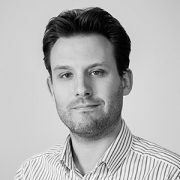 Laurens Rademacher joined Emergex in January 2016. He previously worked as an R&D Manager at Sylus Pharmaceuticals, a company focused on foetal-maternal health. Laurens founded PDC Pharma Limited, a biotechnology company that aims to use synthetic insulin messengers in the treatment of Alzheimer’s disease. He has managed numerous projects, the largest being a multi-site, international, clinical trial for a preeclampsia diagnostic. He holds a B.Sc. in Neuroscience, an M.Sc. in Economics and is enrolled at the European Centre of Pharmaceutical Medicine (Basel, Switzerland) in the Pharma-train Drug Discovery Program.